Karate videos - karate moves, techniques, self-defense. Karate for Kids videos. JB Berns’ Perfect Martial Arts Workout DVD is a series of exercises that have their lineage from the martial arts system created by Chojun Miyagi called Goju Ryu Kara-te. Although originally designed for martial purposes their very movements can help promote a stronger body and mind. The exercises will strengthen participants balance and coordination, along with one’s focus and discipline, and most of all The Perfect Martial Arts Workout is a series of time-tested exercises that are fun and can be performed everyday. The workout that is performed has not been deviated from its initial creation many decades ago ... even the very apparel that was worn has been kept to the tradition. Every posture or movement that is performed has some kind of martial application which is reviewed after the workout. The Perfect Martial Arts Workout is for intermediate to advanced exercise enthusiasts, dancers, athletes and martial artists. Many of the postures are contraindicated and ballistic in their movements and could potentially cause injury to the beginner. It is recommended that you watch the workout in its entirety before participating. Bruce Lee, the legend of martial arts and motion pictures, first studied Wing Chun Kung Fu in Hong Kong under the tutelage of Yip Man. When he came to the United States, Lee developed a concept of martial arts for the individual man that he labeled Jeet Kune Do - the way of the intercepting fist. His first book, The Tao of Jeet Kune Do, became a standard in the martial arts field. It was followed by Bruce Lee’s Fighting Method – a series of four volumes complied by Lee’s friend and student M. Uyehara. 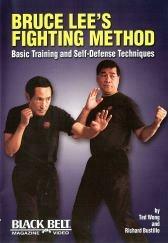 This DVD covers the first two volumes of Lee’s fighting method – Basic Training and Self-Defense Techniques. Topics include warm-ups, basic exercises, on-guard positions, footwork, power training, speed training and self-defense techniques. Demonstrating the techniques in this DVD presentation are Ted Wong and Richard Bustillo. Volume 1 covers basic concepts and features interviews with both instructors. Topics include mat cutting, forms, uniform care, sword etiquette, cleaning your weapon, thrusts, drawing and sheathing the sword and much more. Volume 2 covers intermediate concepts and features interviews with both instructors. Topics include mat cutting, forms, uniform care, sword etiquette, cleaning your weapon, thrusts, drawing and sheathing the sword and much more. In Grandmaster Cheung's Wing Chun Kung Fu, the legendary Grandmaster William Cheung teaches the advanced applications of the three empty-hand forms and delves into the science behind weapons defense, fighting strategy and chi-sao ("sticky hands"). This groundbreaking DVD from Black Belt Magazine has over 90 minutes of instructional material and bonus features including interviews, an in-depth lesson and practice schedule for iron-palm training, and commentary by sifu Eric Oram. Never before have the intricacies of Wing Chun been taught by the premier authority on the art and made available to the home viewer. Grandmaster Cheung's Wing Chun Kung Fu will help both the novice and experienced practitioner reach their full potential. Philippine Fighting Arts presents in-depth theory and practical application of the Philippine arts of arnis, kali and escrima. In Volume 1, you'll learn Single-Stick Tactics and Applications. This exciting new series from Master Julius Melegrito, founder of the Philippine Martial Arts Alliance, features topics such as proper holds, stick construction, striking patterns, applied footwork, blocking, counterstrikes, disarms, locking and choking, coordination drills, partner drills and sticks against empty hands. This DVD features high-energy sequences which clearly correlate Philippine fighting techniques with real-world scenarios such as car-window attacks, ATM assaults, chokes from behind and more! In Volume 2, you’ll learn Double-Stick Tactics and Applications. This exciting new series from Master Julius Melegrito, founder of the Philippine Martial Arts Alliance, features topics such as proper holds, stick construction, striking patterns, applied footwork, blocking, counterstrikes, disarms, locking and choking, coordination drills, partner drills and sticks against empty hands. This DVD features high-energy sequences which clearly correlate Philippine fighting techniques with real-world scenarios such as car-window attacks, ATM assaults, chokes from behind and more. In Volume 3, you'll learn Knife Tactics and Applications. This exciting new series from Master Julius Melegrito, founder of the Philippine Martial Arts Alliance, features topics such as proper holds, stick construction, striking patterns, applied footwork, blocking, counterstrikes, disarms, locking and choking, coordination drills, partner drills and sticks against empty hands. The world can be a tough place and so can your neighborhood. Learning self defense to protect yourself can be the very skill you need to fight your way out of a very dangerous situation. Gene Simco, renowned Jiu Jitsu expert has put together this easy to learn instructional DVD so anyone looking for effective self defense techniques can find it here. Its Jiu Jitsu for the Streets! One-Step Sparring drills are a vital part of the learning experience in almost all martial arts systems. Now there is a resource for developing your own unique One-Step style! We have collected experts from Korean Tae Kwon Do, Japanese Karate, Okinawan pressure-point fighting, Judo, Kempo, Aikido, and more. Each of 101 different drills is performed slowly and at full-speed giving you an unparalleled choice of techniques to learn and practice. About the Instructor: Keith D. Yates is a 10th Degree Black Belt and has been teaching the martial arts for almost 40 years. He has authored or co-authored ten books and his over 400 articles have appeared in every major martial arts publication. He is a certified master instructor (American Council on Martial Arts) and is a member of the Texas Martial Arts Hall of Fame. Mr. Yates is the president of the American Karate and Tae Kwon Do Organization. Hip, upbeat music keeps the work-out fast-paced and fun! Health, fitness, safety, confidence and positive values are important elements of this specialized sport that focuses on self-improvement. Includes a beginners, intermediate, and advanced workout. In Level 1, Karate instructor Ted Nordblum takes the kids through a hip and upbeat workout teaching basic karate stretches and techniques. Karate instructor Brandon Gaines, a third-degree black belt, hosts level 2, which builds on the basics by showing kids the application of karate techniques and adding some new moves that are a little more difficult. Level 3 features sixth degree black belt and international Karate Champion Kenn Firestone, leading three proficient young black belt students in advanced karate techniques. Health, fitness and positive values are all a part of this fun and fast paced program that will motivate and energize kids. Also, check out our Kickboxing, tae kwon do, qigong, tae bo, tai chi, Wing Chun, Budokon or view all our sports videos. Recommend this Karate Videos and DVDs page to a friend.